Home / Posts Tagged "formula drift"
Another Drift race of the season for the books – and a disappointing turn of events for Team Falken. 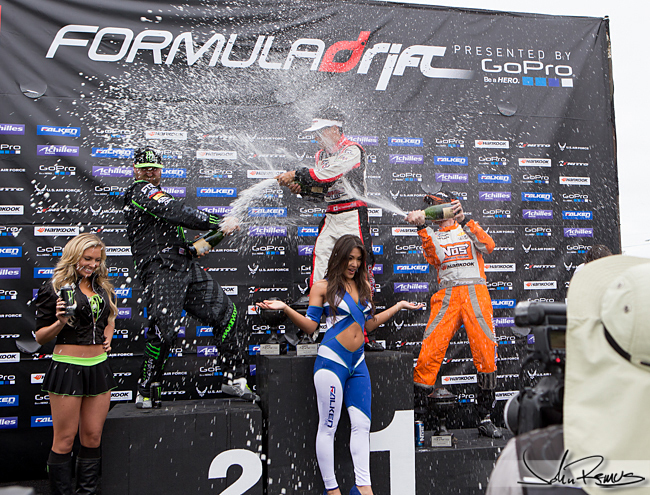 I just got back from Seattle a few days ago where I was out shooting for Falken once again for Formula Drift. This time around I was on my own covering the weekend’s events since the the rest of the creative staff was in Canada for the ALMS race. And while I got plenty of great photos from the weekend, the actual race itself didn’t go all too well for the team. I arrived much earlier than I normally would for a race. I selected a super-early flight for some reason… I was trying to remember why I chose a 630a flight when I was just going up north to Seattle versus cross-country. Typically I seem to handle a lot of the far-away races for Falken. So that means long flights, and lots of travel on my part. But for the life of me and I can not remember why I chose an early flight that put me in Seattle an entire day early. No bother though, it was a chance to test out the extra Sony camera gear I brought along. Thursday for me was a long day… not because I was busy, but because I wasn’t. I wasn’t there to work, so I was just hanging out. I didn’t bring my rental car since I rode with the team. Which left me plenty of time to do whatever I wanted. So, I shot around and took a ton of Behind the Scenes kind of photos of the guys setting up. Getting to know the crew is honestly one of the best parts of my job. Sure, taking pictures is great, but meeting and talking to everyone is seriously the best part. Whether it’s BS’ing with the crew during setup, asking the mechanics about what they’re doing and hearing them explain their job, or sitting at dinner talking with Dai about racing (his job), photography (my job), or fitness (mutual interest), it’s just plain amazing that this is what I get to do for a living. But anyway, you came here for photos… so, read on! Tons of images after the break from Setup, Practice, and Race Day. Also, Falken said “go ahead and play with lighting”… so, the photos are a bit different than I normally take. 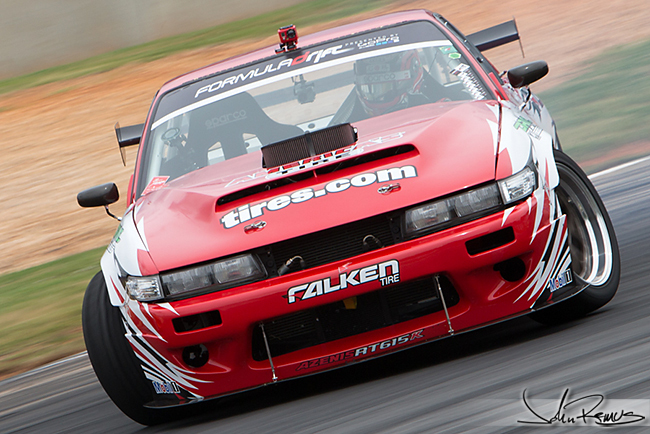 Just got back from New Jersey Formula Drift Round 4, where I was out shooting for Falken Tire again! I wasn’t originally planning on being in Jersey for Round 4, but after contacting Falken on a whim it turned out they needed additional support that weekend. So that worked out great for me since I still had that weekend of June open and am always down to fly to a race to photograph. So after what will likely be my last direct-flight to an East Coast race (you’d be surprised how many tracks I can fly to direct from San Diego) I met up with the video guys and headed out to grab a bite. This was actually the first time I’d really seen the Falken video crew this season. The other races I had be on, Le Mans Sebring, Atlanta Drift, Long Beach, etc, were all for other clients or Falken bookings where I was the only media support. The race weekend was great, and went by pretty quickly. Overall Falken did pretty well. Justin took second place. Darren barely missed third place, finishing fourth. Next up I’ll be heading out to Seattle for Round 5 in Monroe, Washington. Looking forward to that since Falken has said I can go ahead and start being as artsy as I’d like with my imagery from the races. That “they have plenty of action shots” so I can feel free to be more creative with everything. So I’m stoked for that. Also, I just talked and met with Sony Digital Imaging, I’m going to be testing some of their gear! This is pretty exciting. I was given a bunch of gear to test during the month of July! So I’m currently working with Black Flys sunglasses to set things up with their athletes for some awesome shoots with their athletes. Stay tuned. July is going to a lot of fun with all this new gear…. Anyway… on to the Drift photos! There’s a bunch for you guys that just want to see a lot of photos of cars/etc. You will be able to tell the images that are straight from camera and don’t really have any heavy editing applied to them. Oh, also, I’m trying something different for this blog and all the photos that follow are going to be 800 pixels at the longest edge… I’m trying it out to see if I prefer photos a bit larger than my typical 650 pixels at the longest edge. Let me know what you think in the comments about the size change. I’ll need to adjust the right column links though I realize. So I’m finally getting around to uploading the action shots that I took at Formula Drift Round 2: Atlanta. I was out in Georgia two weeks ago or so for the race shooting for Falken Tire this time around. I was the only creative staff sent by Falken, which meant I would likely be on my own the majority of the time wandering the track and getting images out to the Falken team back home on the west coast for them to upload. My flight to the east coast came just two days after my return from the east coast where I was attending my friends Aaron and Danielle’s wedding in Clearwater, Florida. I suppose I could have spoken to Falken about flying me direct from Orlando, but, that would have meant that I would need to bring even more gear with me to Florida on that trip since I would need different things at the race than I had brought to Florida for that trip. Anyway, back in Georgia again, and it really didn’t seem as though it had already been over six months since I was there for Petit Le Mans at the end of the 2012 season. 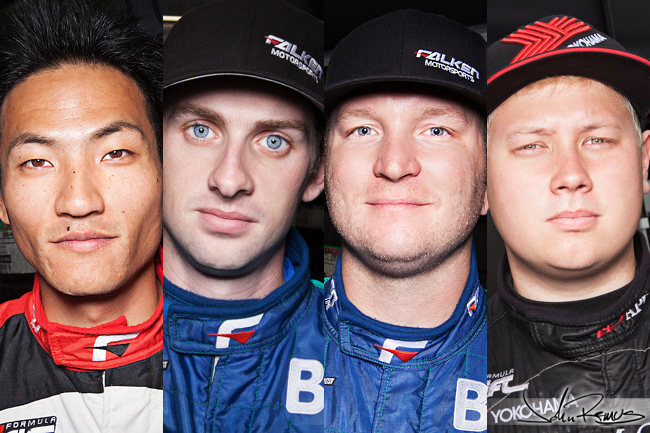 This race I would be focussed on three drivers: Dai Yoshihara, Darren McNamara, and Justin Pawlak. I was also able to continue my ongoing portrait series while out there, as you guys may have already caught in my last blog post. But… Vaughn DID run over a car on the track… that happened. Haha, click past the break a ton of photos from the weekend. I decided to just upload a ton from the weekend. Enjoy. But sheer numbers alone you’re bound to at least dig one or two of them. Two weeks ago I was in Atlanta at Formula Drift Round 2. This time I was out shooting for Falken Tire. 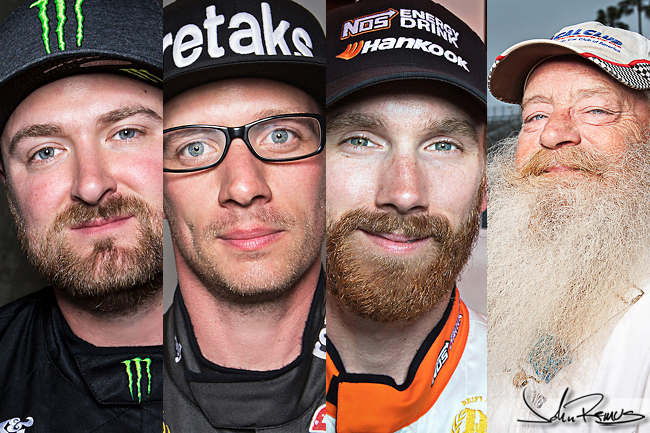 But between my shooting out on the field I was able to find a bit of time to meet up with four additional drivers to photograph and add to my driver’s portrait series that I started at Long Beach in March. I had already been in touch with Dai Yoshihara a bit about shooting with him this round. And I knew that Justin Pawlak and Darren McNamara wouldn’t be too terribly difficult to meet up with since I was shooting for Falken Tire. Meeting up with Pat Mordaunt was unexpected, but great since I was hoping to try and get at least one additional driver beyond the Falken Team. 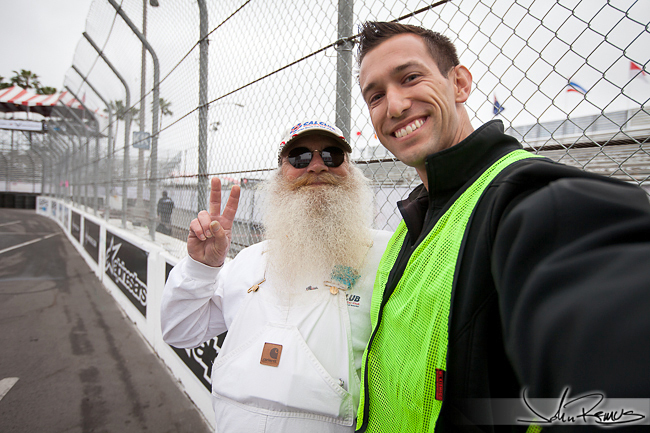 Funny story about Pat and when I first met him at Long Beach this season. I was introduced to him through my friend, and fellow photographer, Narisa Masermsim. Pat was just driving around chatting with people during the morning of Long Beach practice. After a few minutes of typical chit-chat (ie: who are you shooting for, etc) I asked Pat which team he was with. “I’m with APEXi” he said, pointing to the trailer off to the side of us. “Oh, cool, what do you do for them?” “I’m the driver.” Ha! In my defense I’m not familiar with Drift beyond the Falken Team. And typically I handle American Le Mans for Falken and I haven’t photographed Drift much since my days working for K&N Filters and AEM Intakes. Pat just laughed it off. Honestly I forget the the Drift drivers are all very socialable and it’s not uncommon for them to be out chatting with people, versus Le Mans where most drivers stay in their paddocks and rigs. Anyway, click past the break for the various portraits that I shot of everyone in Atlanta. A couple varations of course, a tight crop alongside a wider one. Hopefully I can continue this series in Seattle – which at the moment is the last of the Drift races that I’m booked for. 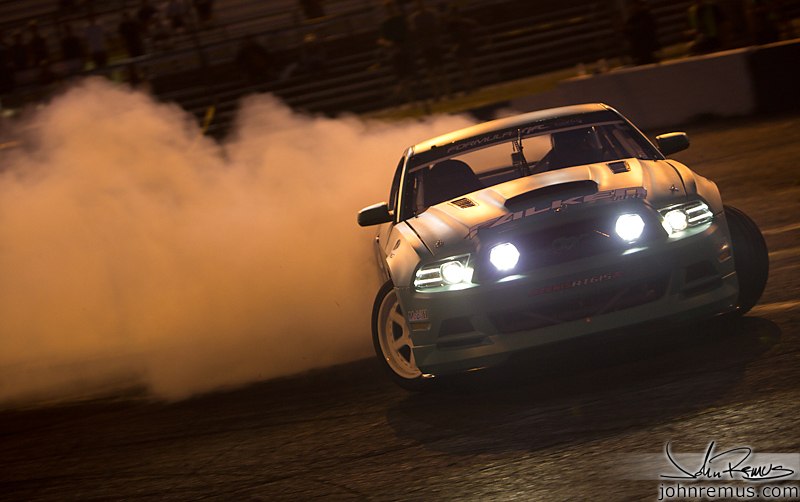 Last weekend was the Formula Drift Finals in Irwindale, Calif. I was invited to attend by Falken Tire – one of my clients who I’ve done a lot of race work for this year. I actually hadn’t shot Drift in a couple years; not since my days handling K&N Filters photography when I was on staff with them. So I jumped at the opportunity to go out and shoot a bunch of new images as well as hang out with my friends on the Falken staff. It’s funny that after living right next to Irwindale for two years and never doing any shooting there that I would have the chance to do so right after moving to San Diego for the remainder of the year. I was able to stay with friends in OC, so it was just a brief trip right up 605 to get to the races. I didn’t shoot this event the same way that I cover Le Mans. So unfortunately I do not have a bunch of behind the scenes photos and stories for everyone like I usually would. Since I was a guest of Falken rather than there working I did my best to stay out of the way as much as possible. So, scroll down after the break and check out shots mostly from the track of the various teams ripping through the turns and destroying their tires for sport.